Swanky Digs: I never thought I could get this excited over a drywall hook. I never thought I could get this excited over a drywall hook. I've been super busy setting up a showhome this week. (I may post pics when it's done - if I decide I like it. Right now it's got me feeling kind of ...meh.) 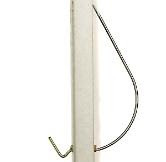 Anyway, I've been using some of these drywall hooks to hang pictures. I got mine at Michaels, but you may recall the Hercules Hook infomercials? (R.I.P. Billy Mays.) These things are just so freaking genius. And they hold so much weight! The ones I got hold 50 lbs, which was all I needed, but the Hercules Hooks supposedly hold up to 150 lbs. Just so darn handy. I'm dreaming of a new sofa.